Detailing the physical features, habits, territorial reach and other identifying qualities of the Basswood Leafroller. The colorful and well-patterned Basswood Leafroller has a lot going on visually, effectively attracting and keeping one's attention. Basswood Leafroller adults do not roll leaves, but their larvae do. Adults generally rest with wings open flat. The upper edges of the forewings have yellow spots outlined in dark brown that vary in size and shape, but collectively look like drips of yellow paint on a white background. The lower part of the wings are dark brown with a purple hue. 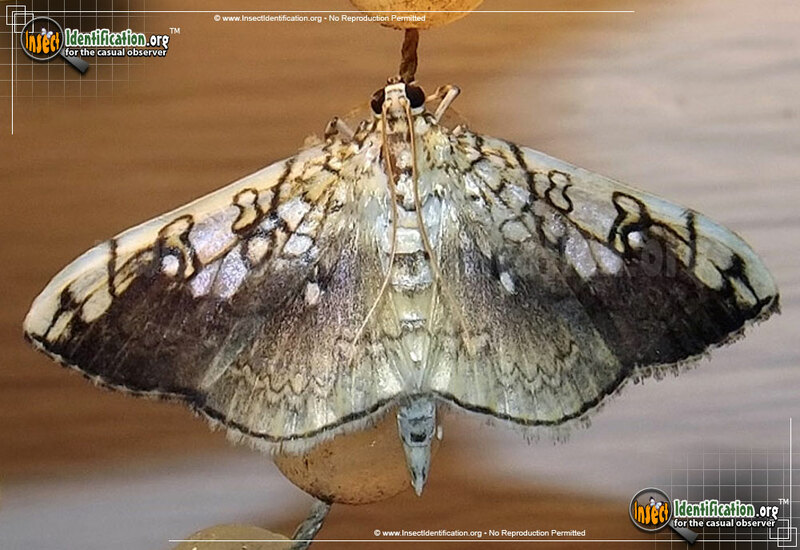 The dark hindwings are lighter yellow toward the middle and bottom edges, and each has a single white dot in each center. Many individuals have a yellow appearance overall. They are attracted to lights at night. Caterpillars eat leaves from basswood, oak, and elm trees. They have a few forms: a green or white body with a black head, or a yellowish-white body with a red head. The caterpillar uses its silk to help roll a leaf around itself. It repeatedly tacks a silk line between the center of the leaf and the outer edge, rolling it as it goes. This provides the caterpillar protection from the elements as well as predators.